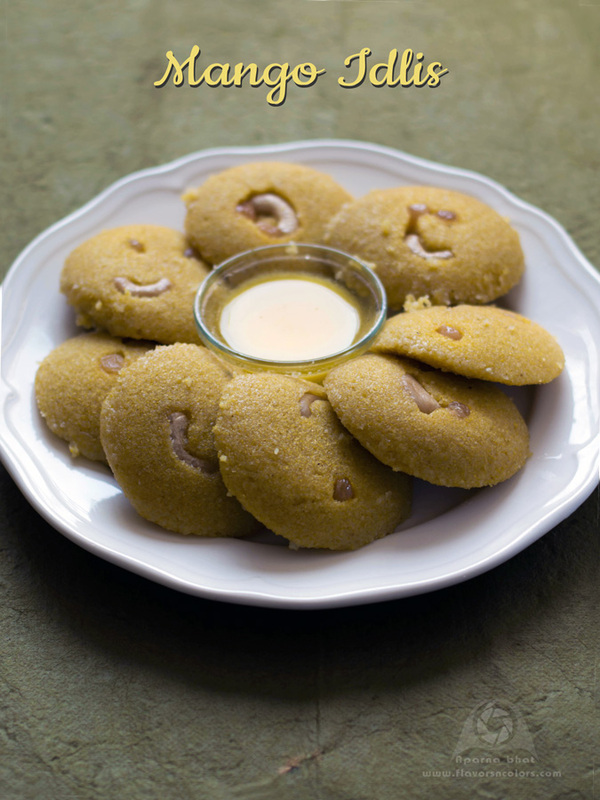 Long back I had posted the recipe of Sweet fruit Idlis. Today's recipe is yet another sweet idli recipe prepared with mangoes. "Mango Idlis", ~ as you hear the name of this dish - the first thing that will come to your mind : is it a snack or a dessert? Whatever it is believe me its such a delicious dish that you cannot stop yourself with eating just one. After the preparation of Mango Lassi, I was left with some unused mango pulp. That's when the breakfast menu got planned as Mango Idlis. The recipe for this dish is same as Ponsa idlis/ Jackfruit idlis, a traditional monsoon delicacy which we konkani people prepare and enjoy with a dollop of home made butter or ghee The idea to use mango pulp instead of jackfruit pulp was mentioned by one of the foodie member in a food group few years back. So let's see how these idlis are prepared. Wash the rice rawa and keep it aside. Grind the grated coconut along with powdered jaggery and mango pulp into smooth paste. Remove the smooth paste into a wide bowl. Add pinch of salt to taste, cardamom powder and stir it well. Add rice rawa gradually and mix it nicely to a smooth batter. If you want add little water to adjust the consistency of the batter like any idli batter. Let the batter rest aside for 30 mins. Meanwhile, heat the water in the idli steamer. Grease the idli mould with ghee. 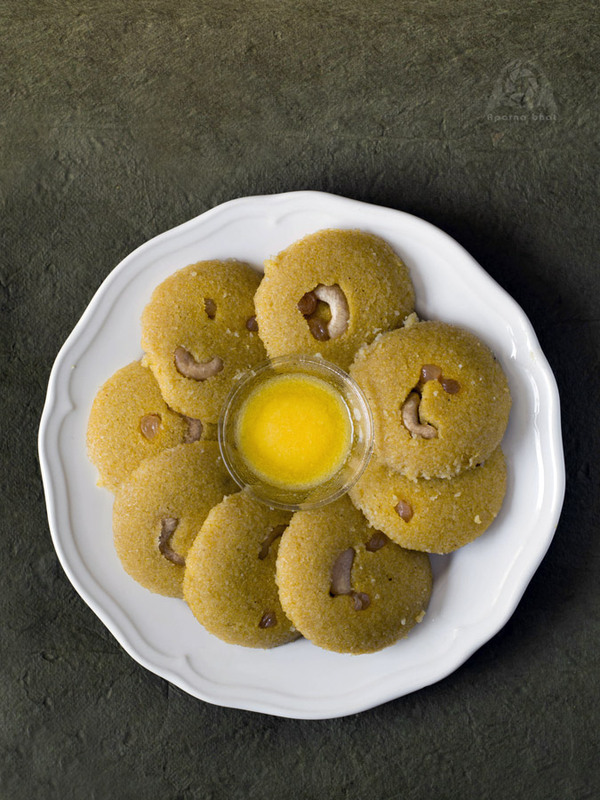 Place cashews/raisins or both in each mould of the idli plate. Pour the batter in the greased moulds and steam it for 12- 15 miniutes. Once done switch off the flame and allow them to cool. Remove from the steamer and keep it aside for 5 mins before you unmould them onto the serving plates. Serve them warm topped with ghee or honey.